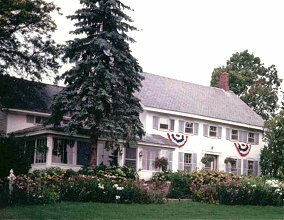 Retreat to a simpler era at Adirondack Meadows Bed and Breakfast. This vintage 1823 farmhouse is located along Lake Champlain in New York's beautiful Adirondack Park. While some B&Bs are more like museums than homes, you can rest assured that Adirondack Meadows will be your home away from home in the Adirondacks. 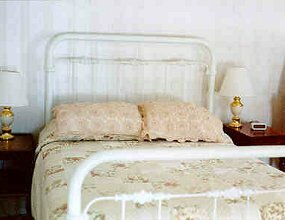 Our rooms are furnished with the simplicity of a 19th century farmhouse. The beds are dressed in handstitched quilts and there are cozy flannel sheets in the winter. Fresh flowers from our perennial gardens welcome you and our vegetable garden garnishes your full country breakfast. Children of all ages may enjoy gathering their own eggs from the barn in the morning. And if you would still like to visit a museum, we can refer you to some fascinating ones in the area! The Adirondacks and Lake Champlain can provide quiet scenic beauty, spectacular Fall foliage, hiking trails, sailing, canoeing, bicycling, skiing, fishing, birdwatching, arts and cultural events and other seasonal activities. Nearby Lake Placid and Lake George are bustling with activities for families and sports enthusiasts. Historic Ticonderoga, Crown Point and Essex will entice American History buffs. Vermont is just a 20 minute scenic ferry ride away and Montreal is 1 1/2 hours by car. Inn rates for our four guest rooms are from $65 to $79 nightly and include full country breakfast. A two-bedroom fully equipped apartment can accommodate a large family or group and is available for weekend or weekly rental. Please call for further information on rates and availability. Children are welcome and pets may be accommodated upon request. This and other Lake Champlain Bed and Breakfast Inns can be found here in The Register.